Love Made Love always presents a collection that encapsulates fashionable style and is synonymous with elegance, this season is no exception. Filled with distinctive prints and striking designs, this selection of must haves will ensure girls are dressed to impress. Combining textures and fabrics for the ultimate finish, you are sure to find something perfect for her in this fabulous collection. Girls red, dress by Love Made Love. Made from a soft textured, cotton blend jacquard with a pretty shimmery paisley pattern and a smooth cotton lining. In an A-line style with sleeves to the elbows and a mandarin collar, fastening with a concealed back zip. 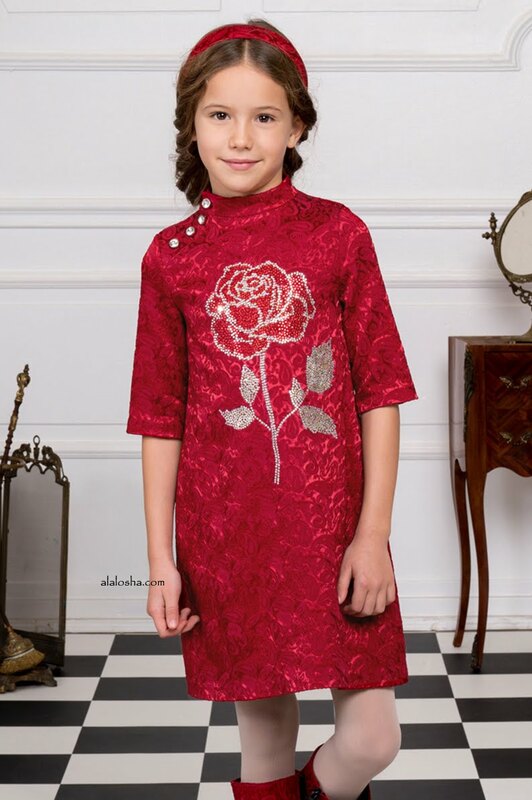 It has decorative diamanté buttons on one shoulder and a stunning rose in red, silver and gold diamanté on the front. Girls gorgeous black, soft satin dress by Love Made Love. 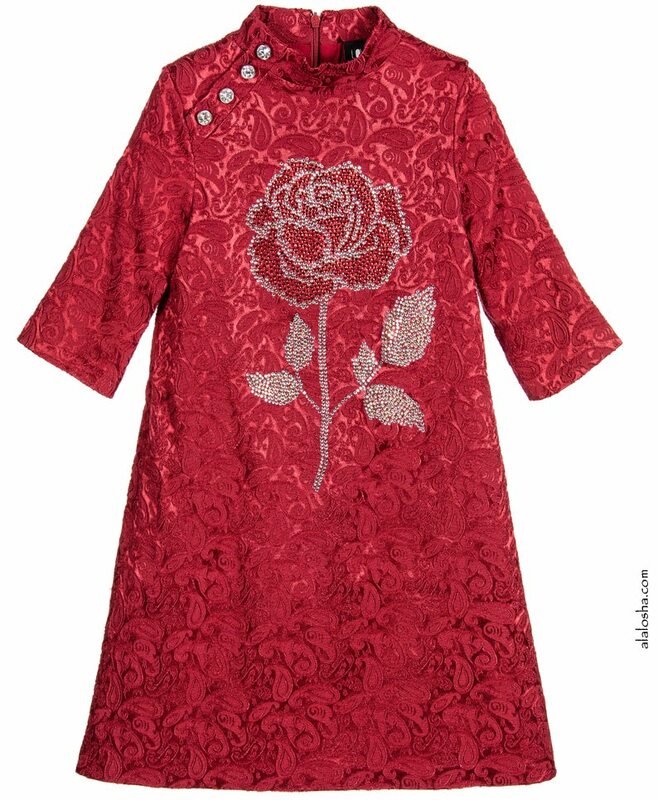 It has a pretty floral pattern decorated with colourful diamanté and fastens with a back zip. In a princess style, it has a fitted bodice and a full voluminous skirt with layers of tulle beneath and lined with smooth cotton, to ensure comfort. 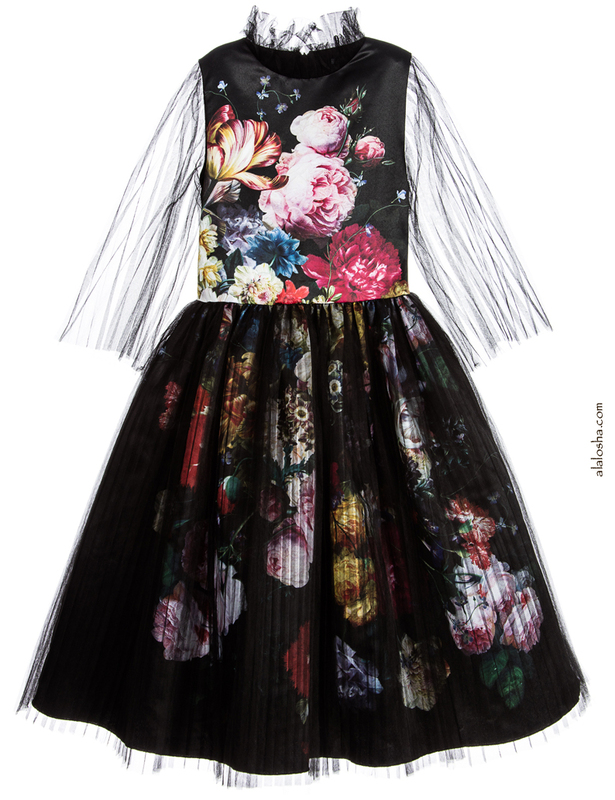 The ruffle collar and sheer sleeves are made with soft pleated tulle and there is a matching layer of pleated tulle over the skirt. Girls white long-sleeved hooded, zip-up top and black tracksuit trousers by Love Made Love. They are made in soft sweatshirt cotton with an elasticated waistband on the bottoms and a zip at the front of the top to fasten. The top features a black floral print and a ribbon at the neck to tie into a bow. For a bold finish, the front of the top has a slight silky feel and the flowers have been coloured in rich tones with intricate detail. 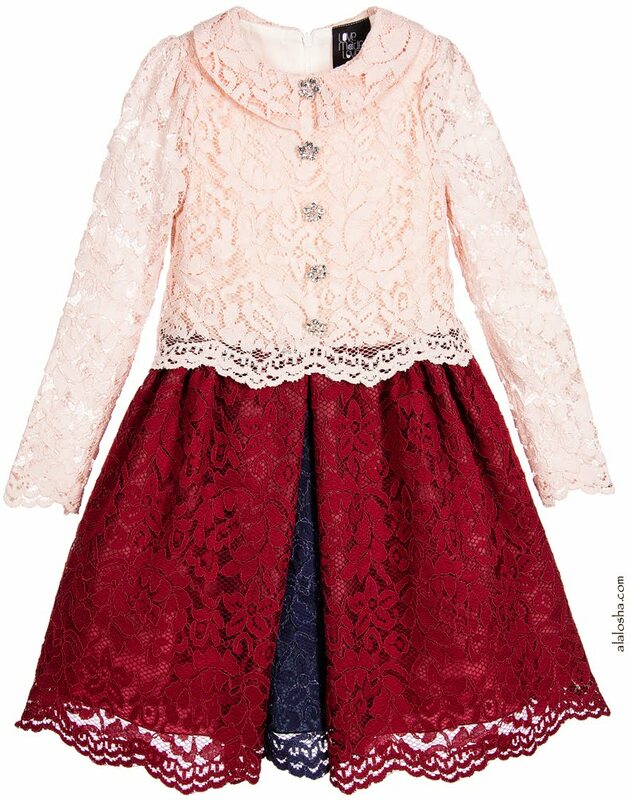 Girls pink and burgundy dress by Love Made Love, made with soft cotton lace over a silky feel fabric. With a layered look the pale peachy pink blouse style top over hangs the skirt. 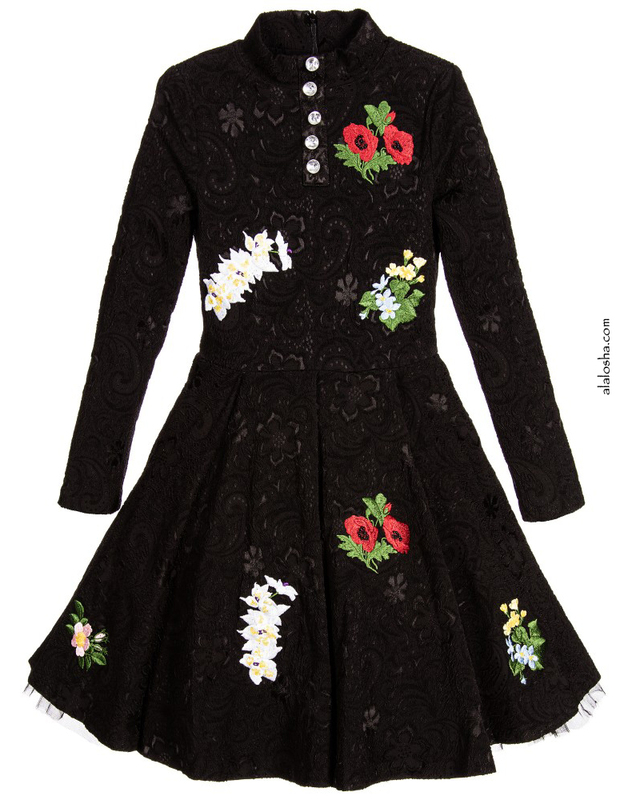 It has a collar, a back zip fastening and sparkling flower diamanté decorative buttons on the front. The full burgundy skirt has gentle gathering around the waist and a deep pleat with a navy blue insert. It has layers of soft tulle adding volume and a smooth cotton lining, to ensure it is soft against the skin. Girls black long-sleeved dress by Love Made Love. Made from a soft textured, cotton blend jacquard with a pretty shimmery paisley pattern and a smooth cotton lining to ensure it is soft against the skin. The colourful flower decorations are handmade and have tiny bead and sequin details and there are diamanté button details on the front and cuffs. It has a fitted bodice and a full and voluminous skirt with pleating around the waist and layers of tulle beneath. 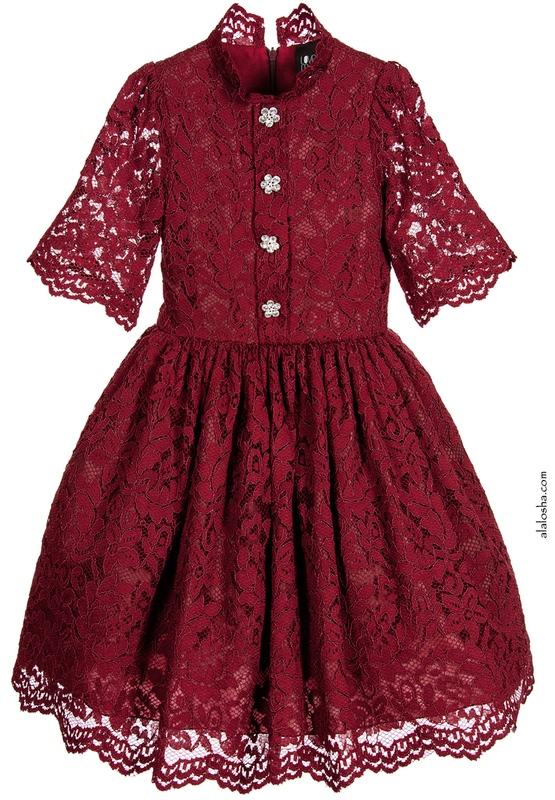 Girls burgundy red dress by Love Made Love. Made from a pretty cotton floral lace over a layer of silky fabric. It has a fitted bodice with pretty three quarter length see-through lace sleeves. It has a mandarin collar, a back zip fastening and decorative, sparkling diamanté flowers on the front. The full, flared and voluminous skirt has gentle gathering around the waist and layers of soft tulle. It has a smooth cotton lining, to ensure it is soft against the skin.